Chang Tzu from 52 #25. Egg Fu is a fictional supervillain appearing in DC Comics publications and related media, commonly as an adversary for the superheroine Wonder Woman. Most frequently represented as an enormous sentient egg (and often, inexplicably, of Chinese descent), he was created by Robert Kanigher and Ross Andru where he first appeared in Wonder Woman #157. Over the years, multiple versions of the character have appeared with varying backstories and alternative names (including Egg Fu the Fifth, Chang Tzu, and Dr. Yes) to battle not only Wonder Woman, but also the Metal Men, Checkmate and Harley Quinn. In early appearances, the character was a Yellow Peril ethnic stereotype, complete with caricaturish Asian facial features and dialogue written in a phoneticized Chinese accent. His name is an obvious play on the name of a Chinese ethnic dish, egg foo young. Certain 21st-century updates, such as changing his name to Chang Tzu and affiliating him with DC Comics' Chinese superhero team the Great Ten, maintain his Asian ethnicity while striving to de-emphasize problematic aspects of his historically racialized characterization. Appearances in Harley Quinn in 2014 and Harley Quinn and Power Girl in 2015, though restoring the name Egg Fu, have expunged overt associations with Chinese culture and language. Egg Fu debuted in Wonder Woman #157 (Oct. 1965). He was a Chinese Communist agent, perplexingly shaped like an egg the size of a house, with a Charlie Chan-like speech pattern, who used his mustaches as whips against his enemies. In Egg Fu's first appearance, Steve Trevor is captured by the Chinese mastermind and turned into a human bomb. Egg Fu then launches Steve and a doomsday missile at the American fleet. Wonder Woman intercepts Steve, who has become a deadly menace. She is unable to save him, but she redirects his path into the enemy missile. The explosion destroys the missile, Steve, and Wonder Woman herself, but the fleet is saved. Informed of her daughter's demise, Queen Hippolyta gathers the remains of Wonder Woman and Steve Trevor and returns them to a laboratory on Paradise Island. Using an atomic structure reassembly beam, she restores Steve and her daughter. However, Steve's body is still infused with explosive energy. Wonder Woman finds that her own body has also become explosive, making them both a danger to the world. They leave Paradise Island. Wonder Woman plans to use the explosive power against Egg Fu. The Chinese leader sends his troops against her, but they fail in their task to overcome her. A piece of anti-matter removes the explosive matter from Steve and Wonder Woman, then the Amazon defeats Egg Fu. Egg Fu the Fifth, a relative of the original Egg Fu, debuted in Wonder Woman #166 (November 1966). Wonder Woman and Steve Trevor investigate the disappearance of an American submarine. While flying over the ocean where it disappeared, Wonder Woman's plane is fired upon by an enemy freighter. Steve boards the ship, then disappears too. Wonder Woman's plane is drawn underwater into a giant seashell. Frogmen attack her and take her prisoner. She is brought to a secret base controlled by Egg Fu the Fifth. Held prisoner by her own magic lasso, Wonder Woman offers to dance for Egg Fu. She then performs a bracelet-clashing dance which cracks Egg Fu and allows her to escape and rescue the stolen submarine. Dr. Yes (a reference to Dr. No), Egg Fu's robot twin, appears in Metal Men #20 (June/July 1966). [original research?] In the story, he uses a giant robot to capture Will Magnus, thereby luring the Metal Men to his base where he brainwashes them, believing that "when the Amelicans see how these gleat heroes of theirs have turned tlaitors-- they will doubt anyone's stlength to lesist us!" The giant robot takes the Metal Men to a football stadium that is celebrating "I am an American Day". Fighting the urge to say "Down with America!" in front of everyone, the Metal Men self-destruct instead. An angry Dr. Yes tries having the giant robot destroy the crowd instead, but the various pieces of the Metal Men attack and destroy the robot, freeing Magnus who had been trapped inside. Afterwards, Magnus rebuilds the superhero team. Dr. Yes is still at large at the story's end. Following the Crisis on Infinite Earths, a new version of Egg Fu was introduced in Wonder Woman vol. 2, #128 (December 1997). This Egg Fu is a nineteenth-century super-computer, recently rediscovered and turned into one of many carnival attractions along Gateway City's Oceanside boardwalk, despite public protests that the attraction is racially insensitive. Egg Fu is actually a product of Apokoliptian technology created from a device Scott Free accidentally left behind on a visit to Earth. Once activated, it begins dominating people's minds and preparing them for transport to Apokolips. Egg Fu is defeated by Hippolyta (at the time acting as Diana's successor as Wonder Woman), Donna Troy, Artemis and Wonder Girl. An associate of Mister Miracle, Metron, removes it. Following the events of Infinite Crisis, a new version of Egg Fu appears, calling himself Chang Tzu (likely a reference to Chuang Tzu, or possibly Sun Tzu. ), an agent of Apokolips. Chang Tzu (Chung Zhu) is the mastermind, along with Bruno "Ugly" Mannheim, behind the kidnappings of many mad scientists in the comic book series 52. They are forcibly recruited into Chang's "Science Squad" based on Oolong Island. Chang has a large, egg-shaped body with facial features and cracked skin, mounted in a spider-legged chair for mobility. He is equipped with small prosthetic hands that allow him to manipulate items and equipment; he is also armed with hidden weaponry. Shortly after Black Adam escapes confinement on Oolong Island, Chang Tzu is shot apart by one of his kidnapped scientists, Dr. Will Magnus. Magnus claims to be acting irrationally due to a lack of medication. A new, smouldering egg was seen hidden in Chang's shattered remains. When he later reappears and is asked about his seeming destruction, he explains, "My third incubation ended four months ago." "Never in my wildest dreams... did I imagine I would meet a creature I pitied more than myself." As revealed to Alan Scott by Thundermind, Chang Tzu and his Science Squad are members of the Great Ten that provide, among other things, the funds to operate the organization and the technology they use. His name is unclear as it has been inconsistently presented; he is introduced as Chang Tzu, but is subsequently referred to as both Chung Zhu and Chung Tzu. It may be possible that he has multiple names; Chang himself explains that "Egg Fu" is one of his "Nine thousand and nine unmentionable names", and immediately kills a guard who laughs at his mention of it. 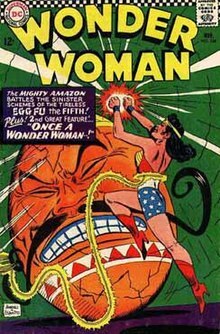 Chang Tzu reappeared in a short story published in Wonder Woman #600, where he was defeated by Wonder Woman, Power Girl, and Batgirl. In the New 52, Egg Fu appeared in Harley Quinn Annual #1. In the comic, he is Edgar Fullerton Yeung, a giant egg scientist who is secretly experimenting on Poison Ivy at Arkham Asylum. However, he ends up reforming with the help of Harley Quinn and gets himself a job. Egg Fu appears throughout the DC Rebirth iteration of the Harley Quinn series. Chang Tzu appears in DC Universe Online. He appears in the Oolong Island group combat alert where he is the final boss. Chang Tzu appears as a playable character in Lego DC Super Villains. Egg Fu appears in issue #16 of the Batman: The Brave and the Bold comic book. In this continuity, he is a demonic entity known as Y'ggphu-Soggoth, and is summoned by Egghead to cause havoc only to end up fighting Batman and Wonder Woman. ^ Wonder Woman #157 at the Grand Comics Database. Just When You Least Expect Him, It's...Egg Fu? This page was last edited on 3 April 2019, at 14:29 (UTC).